Bargain Printing prints greeting cards year round. 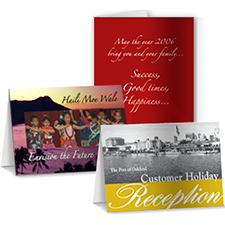 We specialize in printing business greetings, but we also offer free templates for your holiday greeting cards. All cards are printed on a heavy 14 pt stock paper (uncoated inside) and can be full color on all 4 sides. Prices include standard white envelopes. We print the most popular sizes in the industry, 5" x 7" (finished size) or we can trim your card to a custom size, for example, a square shaped card. Greeting cards are scored and shipped flat. Greeting cards aren’t just for the holidays anymore. You can use greeting cards to send a quick thanks, a follow up, or a few words about a new product line. Featuring your image and your message, you can send a greeting card any time of the year just to let your customers know you’ve got a new web address. And when the holidays come around, you can be ready. You can use custom holiday cards to send out new business cards, coupons, gift certificates, and seasonal promotions. It’s a great way to keep your client address book up to date too. If you can encourage your customers to get in touch with you when they move, you can make sure you stay in touch. Consider the impact you can make with greeting cards. They have a longer shelf life than other promotions and they give you the chance to make a personal pitch. If you are a fundraiser, you can use greeting cards in your stewardship of past donors to make sure they think of you in the future.